The bronchus (or pleural, the bronchi), are the airways that lead from the trachea into the lungs, and then branch into smaller bronchioles. Structurally, the bronchi are made up of cartilage that gives them stability and prevents their collapse. The bronchi function primarily as passageways for air, but also play a role in immune function. A number of different medical conditions can affect the bronchi, ranging from bronchitis, to aspiration, to bronchospasm with asthma. A bronchus is either of the two major branches of the trachea that lead to the lungs. The bronchi begin when the trachea divides to form the right and left main bronchi (the pleural of bronchus). These bronchi, in turn, travel to each of the lungs. The bronchi divide first into lobar bronchi, and then tertiary bronchi called segmental bronchi, followed by three more generations of progressively smaller bronchi (fourth, fifth, and sixth subsegmental bronchi). These vessels become progressively smaller and no longer contain cartilage as they divide into bronchioles, terminal bronchioles, respiratory bronchioles, alveolar sacs, and finally into the alveoli where the exchange of oxygen and carbon dioxide takes place. The bronchi are made up of smooth muscles with walls of cartilage giving them stability. 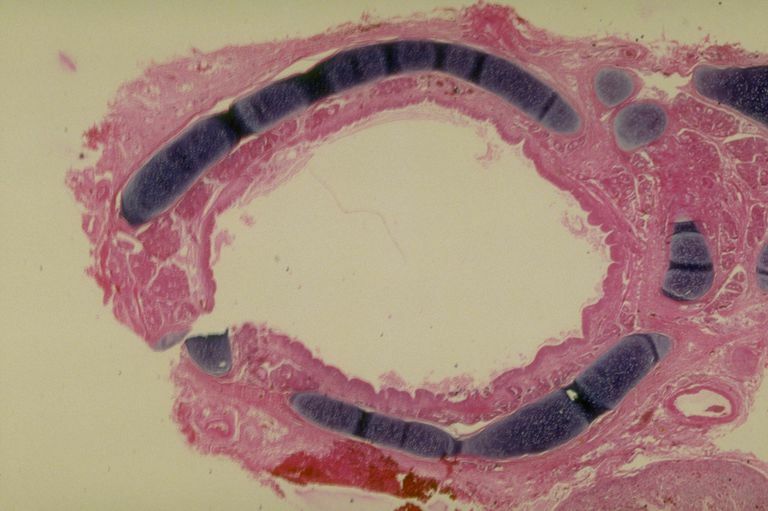 These airways appear very similar to the trachea under the microscope. Airways such as the bronchi are referred to as the "conduction zone" of the respiratory system and are structures where air exchange does not take place. The two bronchi are somewhat different in size and the angles they take, a characteristic that is important in conditions such as the aspiration of stomach contents or a foreign body. Right main bronchus: The right main bronchus is shorter and more vertical than the left, approximately 2.5 m (around 1 inch) in length. It divides into smaller bronchi to enter the three lobes of the right lung. Due to the angle at which the bronchi enter the lungs, fluids that are aspirated (breathed in) are more likely to enter the right lung. Specifically, the smaller bronchus that enters the right middle lobe of the lung is most "accessible" to aspiration, and aspiration pneumonia often occurs in the right middle lobe. Left main bronchus: The left bronchus is smaller and longer than the right main bronchus (approximately 5 cm or 1.5 inches.) It, in turn, divides into two lobar bronchi which enter the two lobes of the left lung. The bronchi function as a passageway for air to travel from the mouth and trachea, down to the alveoli, and back out to the environment. Though the bronchi have been thought of simply structural parts of the body for a long time, we are learning that they may have other important functions. For example, glands in the bronchi secrete mucous which plays an important function for the immune system, both isolating and inactivating pathologic microorganisms. Both acute bronchitis and chronic bronchitis are an inflammation of the tissue of the bronchi. Chronic is one form of chronic obstructive pulmonary disease (COPD) a condition which is the 4th leading cause of death in the United States. If a foreign object is accidentally inhaled, it often becomes lodged in one of the bronchi. Aspiration may be suspected on an x-ray by the appearance of the lung beyond the obstruction. A bronchoscopy is often needed to remove a foreign body in these airways. Some lung cancers arise in the walls of the bronchi, especially tumors such as small cell lung cancer and squamous cell lung cancer. In the past, these types of cancer were the most common type. In recent years, lung adenocarcinoma, a tumor that usually grows in the periphery of the lungs away from the airways is the most common form of lung cancer. It's thought by some that cancers near the airways were more common before cigarettes were filtered, and residue would lodge in these first airways. In contrast, with the addition of filters, toxins may be inhaled deeper into the lungs where adenocarcinomas occur. Asthma is an illness characterized by constriction of the bronchi, which in turn interferes with the passage of air from the environment to the alveoli of the lungs. Among other treatments, asthma is often treated with bronchodilators - medications used to dilate the bronchi and relieve the constriction. Procedures used to visualize the inside of the bronchus and bronchi are helpful when looking for tumors, as well as objects that may have been aspirated into the lungs. A bronchoscopy is a procedure in which a tube (called a bronchoscope) is inserted through the mouth and into the bronchi. A bronchoscopy may be performed in order to evaluate symptoms such as a persistent cough or coughing up blood, but can also be used to treat some conditions, such as bleeding in the airways, or removal of a foreign body. The technique of endobronchial ultrasound is also an advance in the diagnosis of lung cancer and lung disease. During a bronchoscopy, an ultrasound (endobronchial ultrasound) may be performed to look at tissues which are deeper in the lungs past the bronchial walls. When a tumor is located, a needle biopsy may sometimes be performed under the guidance of an endobronchial ultrasound, making it possible to obtain tissue from a tumor without the need for an open lung biopsy. Examples: Jim was told that his lung cancer was located near his right main stem bronchus. Kumar, Vinay, Abul K. Abbas, and Jon C. Aster. Robbins and Cotran Pathologic Basis of Disease. Philadelphia: Elsevier-Saunders, 2015. Print. What Is the Function and Some Common Issues With the Bronchioles? What Are the Alveoli and How Do They Work? Is That Sputum You’re Coughing Up? What Is the Function of Capillaries in the Body? When Is an Endobronchial Ultrasound Necessary?